What does your fridge look like? What does your fridge look like? Here's mine. I'd be interested in seeing what's in between your fridge doors. I think this really helps people out to see examples and see the various things that grace our tongues. Thanks for the recommendation on Slanker's. I live in the Dallas area, so I'll definitely be placing an order soon! I ordered quite a bit of sirloin tips from US Wellness. I've cooked them seven ways to Sunday, and they are tough, even when I have leave them blue centered. I've read the "low and slow" information, but still haven't had much success. Probably my fault for ordering sirloin, but that's what the budget allowed. Be sure and post what you think of Slanker's, Jack. I'm in Okla, so ordering from them would be easy for me. Thanks. can you do a picture,? also drawing would be inspirering. she even helped me determine the amount of meat that my freezer would hold. as to how best to fill out my order to get the largest discount. When you buy 1/4 cow, they do a split 1/4 which is nice--you some cuts from the front of the cow and some cuts from the back of the cow for a nice balanced selection for $695. They called me back when some items that I ordered were unavailable and she made suggestions for replacements. They called me again to let me know my order had shipped, and then called again the next day when my order was delayed for one day due to UPS issue. My order arrived within three days, still frozen solid, everything neatly labeled. upload a pic to an image host (ex: photobucket.com). then when you are in your 'edit answer' box, click the "image" button next to the 101010 (code sample) button. paste the full image html code into the box. Click "Ok". The image should show up in the preview. @WordVixen Yep that's Kerrygold, it's interesting because all those bars on the outside say "made with pastured milk", it normally doesn't have that on the outside, so I wonder if it's seasonal. I keep scrolling up to look at that beautiful butter. It just makes me happy. (Yes, I'm a total geek.) Looks like Kerrygold- is it? If someone tells me how, I will do it! Thanks! We've got a bigger garden this year, so we intend to do a lot more canning and freezing. I hope that if I take this picture a year from now, you'll see a lot fewer store packages, especially for vegetables and fermented foods like pickles. I'm even growing mustard, so maybe that'll be homemade too! yeah! finally a messy fridge to go with mine! i love it. and i love that you can tomatoes, too. haha same here! My fridge isn't even half neat like those who posted here. Thanks! Slanker's has fine customer service and I highly recommend their products. @Edward, No I don't have a generator, but my husband really wants one but we have not purchased one. However, I do have a freezer monitor that sounds an alarm if it gets above a certain temperature. hey. where did my picture go?? @sean That is a German engineered fridge; I live in Germany. Lucky people with American fridges. 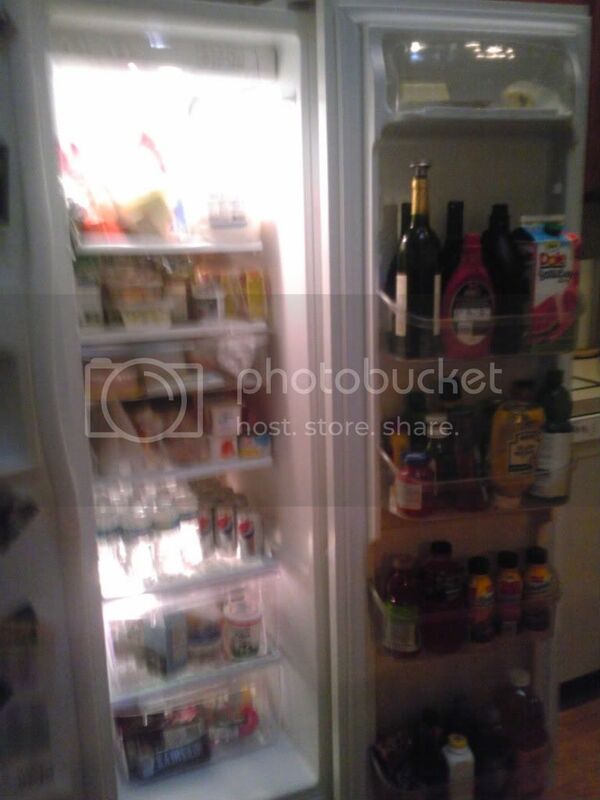 I share a fridge half that size with 2 other people. HOLY SH**! That photo turns me on, hmm!! HOLY SH**! Is it normal that i get aroused from that photo? Is that connected to backup power generator? Between my wife and I, the butter will be gone quickly, no need to freeze it. I don't particularly care for freezing things. No reason. Actually while chocolate and red wine are not off limits, I don't eat or drink it but once and a blue moon, that's the misses stuff as well as the olives and minced beef. I prefer a shot of vodka and room temp chocolate. @Annie I buy meat on a day-to-day as wanted basis. Nothing in the freezer. Usually I'll buy a roast, crock it, and nibble off it all week. @W8liftinmom I used to eat quite a bit of broccoli, spinach, onions and other veggies, then one week I decided that green stuff didn't make sense except in a survival situation. Roots, fruits, animals, and exploiting animals on the other hand make perfect sense to me. I just couldn't see myself choosing a bunch of spinach over a sweet potato or glass of milk given the choice. OUTSTANDING! Now that's a well-stocked freezer! I'm hungry now! Dang that's an organized fridge. But, where's the assortment of farm fresh greens? So that's what a 1/4 cow looks like. Good thing my friends with the chest freezer are going to share that with me when we get ours, plus some goat and some pig. That's gonna be a lotta meat! Yeah, really sorry about that. I realize now that what happened was I *thought* that I had undeleted the post, but really you were the one who had undeleted it -- so you probably thought I was deleting your post for no reason! thanks for trying, this took me and my husband a good while to figure out what I was doing wrong! Texasleah: this is awesome. By the way, I was trying to fix your image link earlier on your other post and I accidentally undeleted the post, so then I re-deleted it. Sorry if I caused confusion! ok. i sucked it up and posted one of the pictures. just to take the cleanliness factor here down a notch. what is up with everyones neat and clean and organized fridges?!?! i feel like im being featured on "hoarders"! 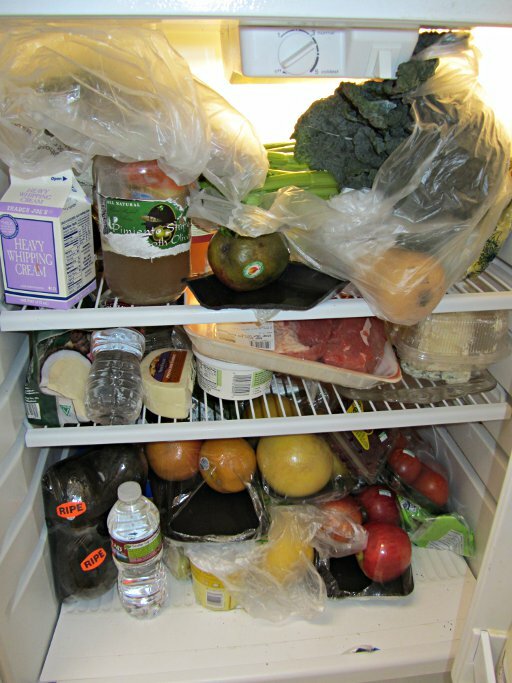 Empty space in your refrigerator?! I don't know what that means. We have Chipotle's within my usual stomping grounds and the Paleo Burrito Hacks intrigue me, for some reason, I just never end up there! I expect that to change soon. I am on my own this Saturday so I can eat wherever I want! The bulk of my food spends most its time in the freezer or at room temp. Assuming I understand you correctly: Is it a stereotype that Germans have neat refrigerators? nice! i also have a paleo.licious facebook album of food pictures. i think its prompted some people to hide me, and inspired some other people to come to the dark side. Apparently you haven't visited paleofridges.com? No, actually I was taking pictures of food for facebook uploading, after making a smorgasbord of paleo delicacies (coconut-bunned burger, parsnip fries, dark chocolate truffles). Since the album only had three pictures, I included one of my healthy fridge to embarass friends into eating healthier. Apparently you haven't visited paleofridges.com? No, actually I was taking pictures of food for facebook uploading, after making a smorgasbord of paleo delicacies (coconut-bunned burger, parsnip fries, dark chocolate truffles). Since the album only had three pictures, I included one my healthy fridge to embarass friends into eating healthier. Apparently you haven't visited paleofridges.com? No, actually I was taking pictures of food for facebook uploading ,after making a smorgasbord of paleo delicacies (coconut-bunned burger, parsnip fries, dark chocolate truffles). Since the album only had three pictures, I included one my healthy fridge to embarass friends into eating healthier. LOVE IT, LEAH. I could be embarrassed, but mostly I am impressed that I can avoid all of that stuff even when it is right in front of me. fyi: you can't both be evil twins. there has to be one good one and one evil one. that is how the evil twin dichotomy works. i strive for such a minimalist, clean fridge! my kids cramp my style. 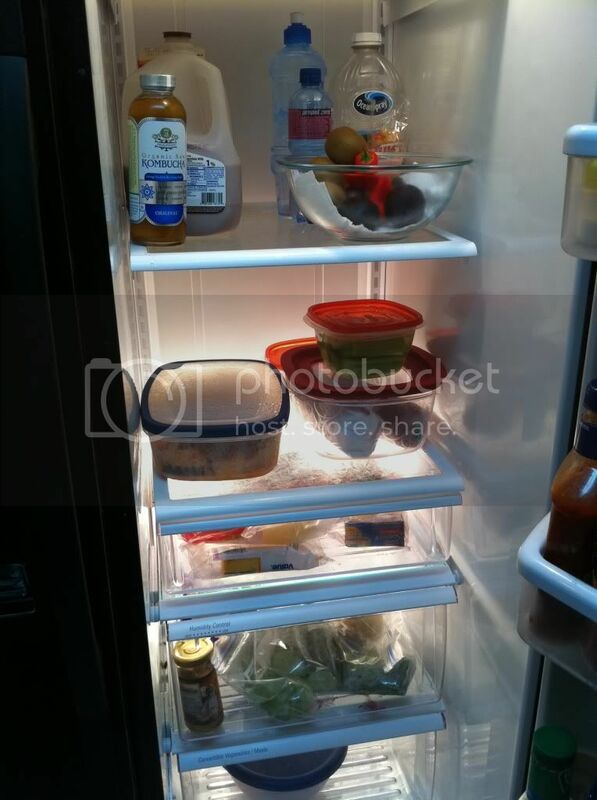 i have to ask though, what possessed you to photograph your fridge "a few months ago"? also, hip hip hooray for red velvet cupcakes. we are evil twins! that is about what my fridge looks like! WCC Paul, you stole my joke. Well played. Now you just have to employ that as an answer to a hack. Q: "How do I store kimchi properly?" A: "You must eat a lot of butter!" WCC Paul, you stole my joke. Well played. Now you just have to employ that as an answer to a hack. Q: "How do I store kimchi properly?" A: "You must eat a lot of butter"
Uh-oh. My first Chipotle ever was in your hood (Evanston, IL). Get thee to Chipotle! What if, god forbid, your house was burglerized? And they took all the neolithic food?? Your husband might have to temporarily eat paleo. Just imagine that you are a single, lazy male. Then imagine that you replaced all your lunches that week with Chipotle paleo-burrito-hacks. This is the result. Never mind what's in it...the neatness is mind boggling! Mmmmm cupcakes. I can't imagine having a fridge so empty! Yes I did! It doesn't look that much different than mine, except yours is less SAD. did you see the pictures? its a total disaster in there. @Texasleah: and if you press on the icon there will be a little prompt that will take you to free photo hosting, it's pretty easy. And also, as Matthew says: in order to post a picture you must eat a lot of butter. @leah - You have to host it somewhere like photobucket and then when you are in your answer, you click on the little polaroid looking icon and put your url into it. You must eat a lot of butter! warm feeling, which is why I put 'warm'. the coldness takes away from the 'warmth' of the red wine. no, myth that red wine should be warm. it should be closer to 50-55 degrees. i totally meant to ask that about the red wine andrew. red wine is supposed to be 'warm'. I've never seen so much butter in a residential fridge. you chill your red wine? 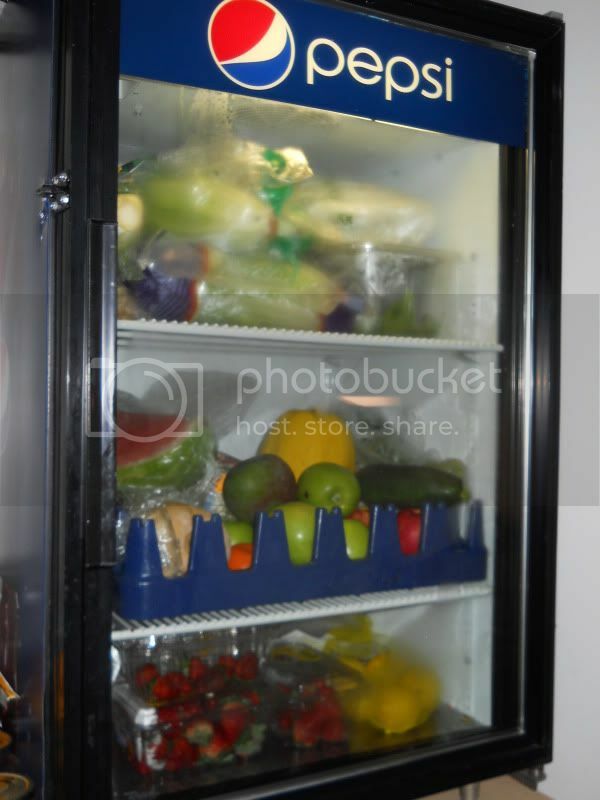 less fruit, more meat, no ketchup and that would be my dream fridge! jeeze....i might have been more likely to share a picture of my fridge before i saw how damn spotless yours is. now im just ashamed. food looks good though, but i agree with jck that some of that butter should be placed in your spotless freezer that probably also puts mine to shame. Just a hint, you shouldnt store chocolate too cold. I think about 60 degrees F is optimal according to chocolatiers. Dangit. You beat me to it! I was gonna do this. Nice job Ed. I'll post mine someday after I fill it up real nice. Hey that's A LOT of freakin butter dude. You need to put some of that in the freezer. It keeps perfectly and thaws in the fridge in just a couple hours, and on the counter in less than an hour from frozen. Cool looking stuff though. Thanks for sharing! My freezer: 1/4 GF cow from Slanker's in Paris Tx, along with some of their pork chops, a couple of hams, some free range chickens. Quite a bit of venison, and a bunch of Halibut and Lamb. Notice the wedding cake top in the bottom! Top row: grapes, strawberries, butternut squash, some other squash? I'm afraid this picture (from a few months ago) is misleading, because I'm temporarily eating a mix of paleo and whatever the heck I want, including most recently red velvet cupcakes. Just got our Family Sampler Pack from Slanker's Grass Fed Meats! about 40 lbs of meat. Bottom shelf in the pic is some grass fed roasts from Whole Foods. It's not as cool as Leah's pic, but hey! this entire freezer is fully grass fed - Legit! Just returned from a trip to Jungle Jim's ( a AWESOME place for paleo!) http://www.junglejims.com/ so we are produce heavy right now. The empty space at the bottom is where I keep my veggies. All frozen grass-fed beef, lamb, wild fish and liver. Bones are in the picture. All organic veggies and fruit. I'll be brave and post a messy fridge to compare to all these neat freaks'. Contents listed below, top to bottom, left to right. The freezer is really packed right now because we had an electrical problem and had to empty one of our other freezers in a hurry, and I haven't moved everything back yet. But some things you can see on the left are frozen vegetables (mostly organic), leftover chicken bones being saved for stock, raspberries that we picked and froze last year, old chicken giblets that will become dog food, frozen shrimp and cod, ground beef, and a bag of carob powder. (Dunno if carob is paleo, but my wife seems to have a strong gut reaction to chocolate, so she's trying that.) On the right is mostly non-paleo stuff from our "how can we have bread and pastries without wheat" days, that we need to just feed to the chickens. In the fridge, the worst non-paleo offender is probably the Velveeta. My wife (not quite as focused on paleo as I am) still likes that for a cheesy soup she makes. Then there are a bunch of leftovers: swiss steak, cooked chicken, steak, etc. There's an attempt at bacon grease mayonnaise in there, but that needs work; it had too much stale lard smell. Next shelf has eggs from our backyard, yogurt, meat thawing for the next couple meals, and more leftovers. Below that, home-grown/canned tomato sauce, cheddar, more eggs, chicken stock, and raw milk. In the bottom, some vegetables and fruits that may even get eaten before they go bad. Not much significant in the door, mostly condiments like mustard, plus dill pickles, butter, cream cheese, and wine for cooking. I think the apple juice is for coating sliced apples so they don't get brown on the way to the party; we certainly don't drink it. 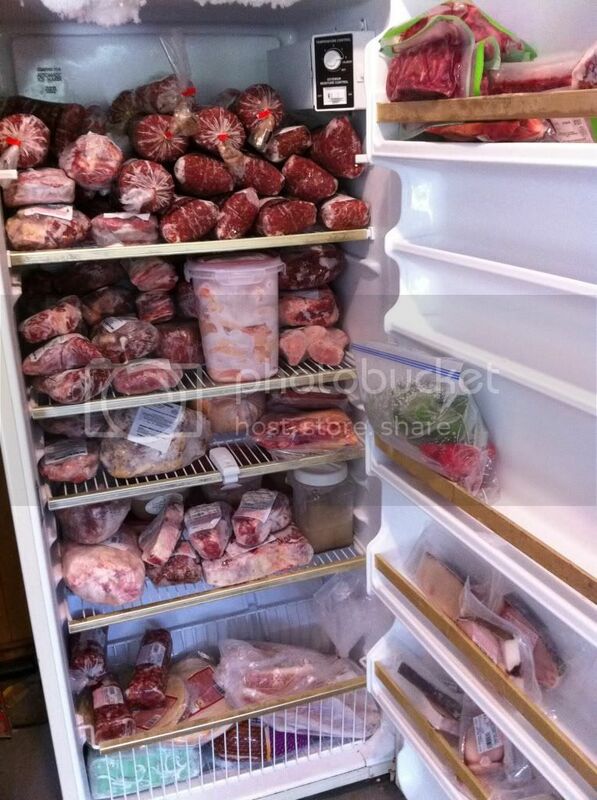 There's not a lot of meat because we've got a full-sized freezer in the basement that takes care of that. Just put 160 pounds of pork in it last week. well, i posted the pictures on facebook. im just going to write out here whats in there and you'll have to trust me. sherpamelissa can vouch for me. ;) keep in mind that while i do the bulk of the cooking and shopping, my kids and husband are not paleo. and in the freezer: wild salmon fillets, shrimp, grilled chicken breast, 30 pounds of grass fed beef, gallons of roasted squash puree, quarts of beef and chicken stock. 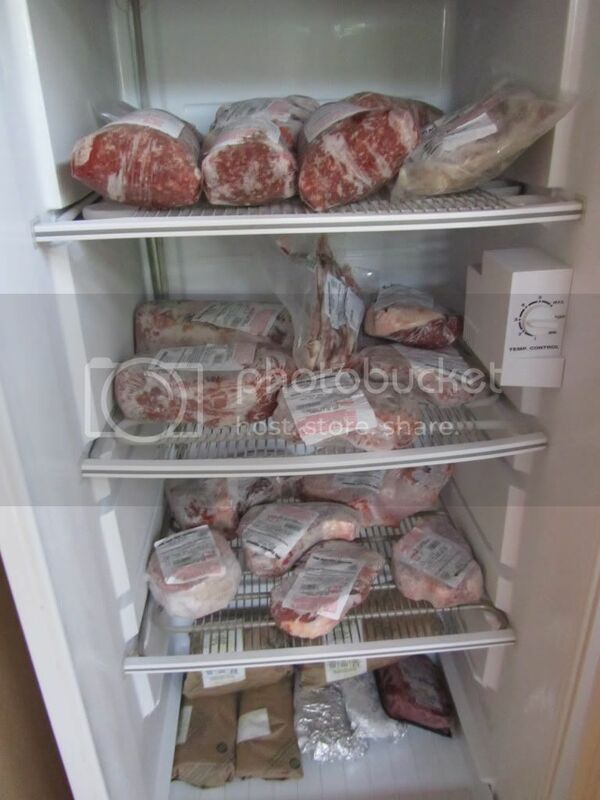 in the downstairs freezer is a bunch of pastured lamb, pastured pork and a couple of pastured turkeys. and on the counter is WINE. ETA: i uploaded the picture, then it disappeared. cant seem to get it up again. youre just going to have to use your imagination, i guess. Berries, pistachios, chicken, pecans, salmon, coconut curry, BBQed and bagged chicken, and lots of beef. I'm neat but only by virtue of the fact that it's just me and my boyfriend to feed! Lime juice, Peppadew jarred peppers, mini jarred pickles. Olive oil, avocado oil, macadamia oil. Locally made pesto, wholegrain mustard, Grated parmasan. Then main fridge is organic farmed smoked salmon, I actually know where they farm this on the atlantic coast and as farmed goes it's pretty good. Kale, cream, duck fat, local honey, brazil nuts, beetroot, olives, thai red curry paste, CLO, soda water and gouda. Some frozen lamb stock, packet wild salmon, more wild salmon, wild mackerel, Frozen plums a friend grew that are too bitter to eat but I keep meaning to turn into chutney. Packet of stir fry veggies and some left over beef massaman curry. There are also some nice little gluten free english muffins that are made of rice and tapioca flour. I have one once a fortnight as a treat with tonnes of butter as they do shocking things to my blood sugar in large quantities! Ein echt deutscher K? ?hlschrank: fein und rein! OMG. I think if y'all could see in my fridge/freezer and pantry you would kick me out of Paleo Hacks! My family still eats SAD, so my food is there, but overshadowed by the other. 3rd drawer: CHOCOLATE, of all kinds. My daughter is a chocolate addict. Damn. I'm not even going to discuss the rest. I hope to someday wean them off these foods, but mostly my husband thinks I'm nuts with a food obsession, so it's not likely. Hm... my fridge - well right now it's full of... loads of egg whites & eggs, salmon skin, spaghetti squash, butternut squash, pumpkin, spinach, unagi/eel, and salmon fillet, yep, that's it! :) I sorta eat the same thing every day so this is generally what's in my fridge ALL the time! And my freezer is full of salmon belly, black cod, grass-fed beef, green beans, grilled vegetables & asparagus! So tempted by this assignment. Kinda glad my fridge light is out or I'm sure I'd be setting up my tripod and shooting the mess that is my fridge. Much meat in various stages of defrost, brine and/or marinade. Numerous jars and bottles of homemade fermented foods, Kombucha, Kimchi and plain yogurt. The door is sagging beneath the weight of my collection of condiments, although I just recently through out a few that had too much sugar or soy or msg in them. Tiny crisper drawer broken from piling veg and fruit into it like an overstuffed suitcase. Keep 2 dozen eggs now. Various jars of homemade jam and brandied cherries I still keep but do not now eat. Cheese in a big plastic box. Then there's the stuff at the back I don't even get near. Old sweet pickle relish, pickled ginger, old jar of preserved lemons, Huge jar of lime pickle. See the theme there? Oh yeah a plate of gluten free chocolate cookies that my freezer is too small to absorb, so I'm desperately trying to give away. Cookies are a weakness. Haven't had any since I made em 2 days ago, so far so good. I can't believe I fit all that into a fridge that's not even full size.